Note: This webinar was originally scheduled for June 5. Due to illness, I’ve postponed this till Monday, June 10, 2013. 8 types of conversational open doors. You’ll have the opportunity to ask questions, share your own stories. Date: Monday , June 10, 2013 9:00 PM – 10:00 PM EST. Eastern US Time. Adjust for your timezone. PC-based attendees: Windows® 7, Vista, XP or 2003 Server. High speed internet access will help you see and hear the presentation via computer. Space is limited to 100 people. Prior webinars have surpassed this number. Free access to download the video after the webinar is over. Streaming option if you don’t wish to download the video. Instructions on how to participate with your own question and answer. If you cannot attend the day of the event, you’ll still have access to the replay. For example, if you’re in church that night, but still want to learn, register to get access to the replay. Or perhaps you are asleep in your part of the world during that hour. If you’d like to learn, please register and get access later. This webinar has a bonus feature if you choose to take advantage of it. 30 days of email coaching about your faith conversations. This coaching aspect will help you apply what you’ll learn. That’s a $67 value as my free gift to those who register for this paid class. Payable on-line via one of the on-line payment links below. You’ll receive an email with your unique access link for the day of webinar. If you lose it, a reminder will be sent. 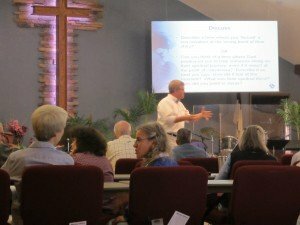 Chris has given Evangelism Training seminars around the US and 9 Countries in Latin America. He is fittingly known as the Evangelism Coach because of his extensive work with churches in the US and Latin America in the areas of evangelism and church growth. Chris is an ordained pastor in the Presbyterian Church (USA). His website has over 1,000 articles on personal evangelism, congregational evangelism, and hospitality, as well as a podcast feed, all for free. He’s produced one audio CD set, and a 3 DVD set on personal Evangelism, and a simple next steps on personal evangelism Audio CD. Q. What happens if I register and then miss the class? You’ll be given access to the replay, typically within 24-48 hours of the webinar. Q. What if the audio is really awful? If a headset is not available, a microphone and speakers are required, preferably a USB microphone for ease of use. If using a microphone, it should be a distance of at least 1.5 feet away from any speakers that are built into or connected to your PC. The use of a Webcam microphone is not recommended. The use of a integrated laptop microphone with laptop speakers is not recommended. Ear buds or earphones and use of the integrated laptop microphone is a workable solution. Q. Why is there no group license for this webinar? I found that a group license creates more work for me and for you as the group organizer. I’ve set the registration fee low enough for individuals to be able to decide on their own. Q. Will I hear pitches for products and services? You will not hear me sell anything during the webinar. There is nothing more to buy. You are buying access to a class and the registration fee helps me cover the cost of the technology. Q. Why do I need to pay the fee? People value what they pay for. I want people who are motivated to learn and will apply what they learn. Free webinars are great when I am selling a product or service, where I can recoup the cost the webinar. Do not be afraid! Evangelism is not scary – or need not be. It can be a friendly conversation. “Attend one. ” You will no longer fear, ridicule or avoid evangelism. More people really want to know Jesus and how to help others reach Him. You will lose your misconceptions about evangelism. Go with an open heart and mind and you will leave fulfilled. You’ll learn to listen better. An inspiring motivational speaker with a message for all. Just do it – You will find that the skills are within, this encourages you to put them to use. The seminar helps you feel more comfortable about evangelism. Tools to share one’s faith with others to help them.